Our body is capable of performing a wide variety of simple and complex functions. It is able to do so because of the internal structure that facilitates its movement. The human skeleton is the internal framework which is responsible for giving support, shape and protection to our bodies. It contains 206 bones, each playing a distinct yet important task. 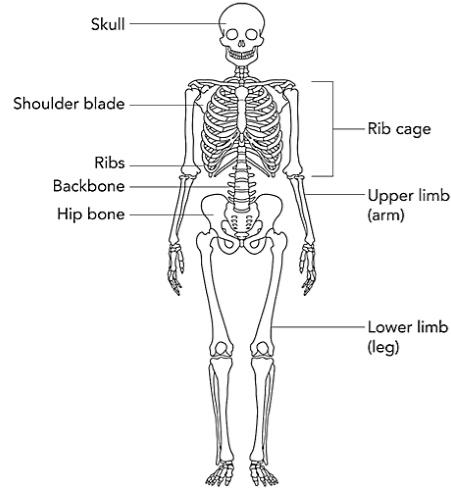 The skeleton can be classified into two parts called as the axial and the appendicular. The axial skeleton comprises of the central part of the skull, spine, and ribs and the appendicular skeleton consists of the arms and legs. Limbs: The arms or legs of an animal. Bones: These are the hard white structures below our skin that protect our internal organs. Bones are incapable of bending. Joints: These are defined as the points at which two bones are fitted together. 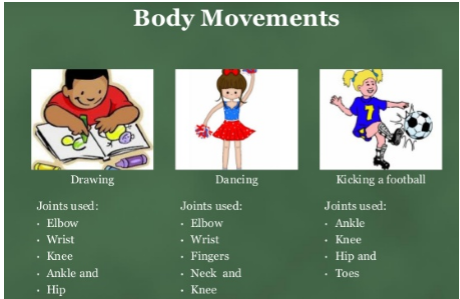 These are the points at which we can rotate and bend our bodies. A Pivot joint is a joint that rotates.. Examples of pivot joints in the body in the neck that allows the head to rotate and the ones between the radius and ulna that allow forearm rotation. When bones can move along one axis, it indicates the presence of Hinge joint. e.g. Elbows and Knees. Bones provide support, protection, movement and perform several other functions. The bones in the skull (Cranium, Mandible, Maxilla) give protection to the brain. The carpals are located in wrist and tarsals are located in ankles. They are examples of short bones. The bones protecting the spine are called as the vertebral column. Cervical area (top 7 vertebrae), Thoracic (next 12), Lumbar (bottom 5 vertebrae), Sacrum (5 fused or stuck together bones) and Coccyx (the tiny bit at the bottom of the spine). The sternum and rib cage constitute the chest bones. It has a slimy body, which does not have bones. 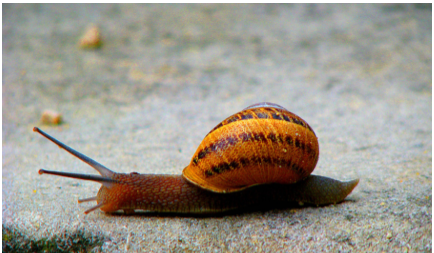 The shell of the snail does not help in movement. It has to be carried along. The foot of the snail is a thick structure and is made up of strong muscles. A muscular organ called ‘Foot’ helps in locomotion. Its Exoskeleton is hard and stiff. Coordination between muscles and tail help the fish to move. Presence of hollow and light bones, which reduces weight. Presence of long backbone and thin muscles. Loops made by its body help in moving forward. 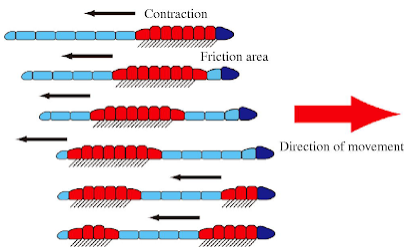 They cannot move on frictionless surface.